We recently reviewed a book written by Nassim Taleb called “The Black Swan”. In it, the author suggests an approach for investing called the Barbell Strategy. The approach is based on the concern that unexpected market events can happen with devastating impact to our portfolios. The Black Swan is about such events that are generally unknown, unpredictable, and cannot be planned against to mitigate losses. Because they are unpredictable they cannot be avoided, we need a way to protect assets as best we can against these unforeseen events. The Barbell strategy uses the two extremes: Ultra conservative positions at one end and highly leveraged, speculative positions at the other end of the risk range. The strategy advocates having most assets in very safe securities like treasury bills or conservative options and a small portion in high risk – high reward securities like long put or call options. 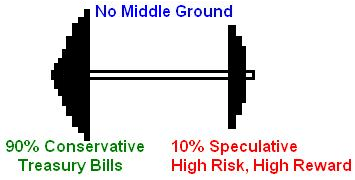 The Barbell image is used to show assets at the two ends of the conservative / speculative spectrum. But the Barbell is unbalanced with 90% ultra conservative and 10% speculative. The concept is to invest 90% of the portfolio in treasury bills, therefore, the portfolio is fairly insulated from unplanned events like a Black Swan. In the event of some catastrophic event only 10% of the portfolio, which is invested in the high risk-high reward investments, is exposed to a loss. The high risk-high reward portion of the portfolio provides most of the returns under normal market conditions. The Barbell strategy is an alternative strategy to our popular RadioActive Trading approach. The RadioActive Trading techniques use a different tactic, but one that is equally effective in protecting a portfolio. RadioActive Trading advocates buying a high growth stock and protecting that investment with a put option. This is referred to as a Married Put strategy, but we use a unique setup to minimize risk, control time decay and lower the daily cost of insurance. The put option insures the stock position by guaranteeing a price at which the stock can be sold. The put strike price is positioned to limit the portfolio risk to less than 1% of the portfolio value. If there are ten holdings in the portfolio, any one maximum loss would only affect the portfolio by 1%, and if all ten succumbed to some Black Swan event, the entire portfolio would have only a 10% exposure. The at risk amount in this RadioActive Trade is 6.8% of the capital invested. If you opened 100 shares of stock and 1 put option, you would have invested $12,340.00, with a total monetary risk of $840.00. In a $100,000 portfolio, this position would only risk 0.84% of the total portfolio, with only 12.3% of the total portfolio value invested in the position. Generally a $100,000 portfolio would have about 5 such conservative option positions. This setup offers limited risk, proper position sizing and an unlimited upside profit potential. The RadioActive Trading techniques satisfy the ultra-conservative portion of the Barbell approach, but investors are more active in these positions as opposed to holding treasury bills. Our trading manuals, The Blueprint and the Home Study Course, help instruct investors on managing the position after it is established. By applying various income methods we can generate income against the limited risk position, reduce the initial at risk and potentially Bulletproof the position. ‘Bulletproof’ means we have canceled the risk on the position and have guaranteed a profit to the downside, while still leaving the upside open. Not all holdings can be managed into a bulletproof position, but many can. In any case, losses are limited and controlled immediately when the position is opened. We have discussed two approaches on the conservative side of the Barbell: Treasury bills and RadioActive Trades, but what about the speculative side of the Barbell? The speculative side may include long calls or long puts, but PowerOptions has developed a credit spread tactic that might be considered also. The credit spread strategy uses a small percent of the portfolio with the goal of making a large gain in a short period of time. PowerOptions has developed a historically tested screening tactic that is primarily in cash and looks for short term credit spread opportunities that are capable of high returns. This credit spread strategy invests about 10% of the portfolio for about 5 days of time in VIX Bear Call Credit Spreads. These spread positions generally return 20% in that period of time. Opportunities to invest in these spread positions happen on average once per month, but there are often stretches of several months when there are no spread trades available to enter. But remember that you can’t lose your investments when in cash and when in cash you cannot be victim to a Black Swan. If the VIX remains below $20.00 at expiration, both calls expire worthless. Although the Bear Call Spread offers a leveraged risk to return ratio ($1.65:$0.35, or about 5:1), applying proper position sizing and only allocating 10% of your total portfolio to this speculative position will still reduce your exposure to a Black Swan event or bad timing. 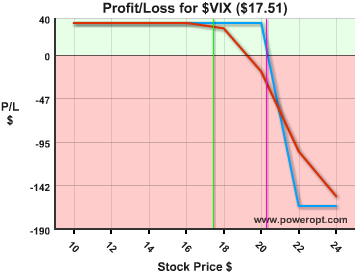 A portfolio setup in the VIX strategy may have many periods of time with low activity. Inactivity is difficult for many investors to tolerate as many investors want more action. Some investors act like gamblers in a casino who jump from one table to the other trying to break the bank. But investing is a business, not a form of entertainment. It takes patience and risk control to succeed in the market and an awareness that a Black Swan may show up at any time. As previously discussed, the RadioActive Trading strategy fills the same criteria for limiting risk as treasury bills, but it allows investors to be more active with trade adjustments and further limiting the already low risk. We have also suggested the use of a VIX credit spread tactic to implement the 10% speculative side of the Barbell as an alternative to long puts and calls. Click Here to see more information on The Blueprint, the full work on implementing the proper Married Put technique (conservative options) and the various income methods to help Bulletproof a position. Click Here to register for a 14-day Free Trial to PowerOptions, to see possibilities for the VIX Bear Call Spread approach, PLUS access to patented search and analysis tools for options traders. Excellent article. Your live webcasts are great, but articles such as these allow the readers to proceed at their own pace. I enjoyed reading this article. Thank you M.K., we are glad you enjoyed the article. We typically like to keep a balance of educational articles, write-ups, live webinars and archived webinars as well. If you have any ideas on content you would like to see as an article, just let us know. We would be glad to let you know our thoughts on the various options strategies and concepts. Great Article Greg. I like the Barbell analogy, but wonder if a little more risk might be in order. 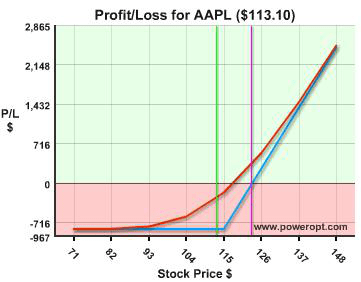 In a similar way one can buy deep in the money leaps, that have very little time value as a stock replacement strategy. This can give high leverage, relatively low holding cost and the ability to leave a lot of money in cash. So instead of buying a $100 stock for $100 you buy the $90 Jan 17 leap for $15. In this case the $5 of time value can be thought of as a 2.5% interest a year for controlling stocks that typically rise 10% a year. told using best options vertical credit spreads monthly? Like to see you help us traders for a month using your expertise in options???? ?